Hmm, Ryde: it’s in the Isle of Wight, isn’t it? I had to think about that for a second. My geography’s rubbish anyway but what threw me was why I might have a badge for just a bit of a small island and not instead the whole island. I do remember at least one visit to the Isle of Wight as a child, the ferry crossing over the Solent, some mini-golf, some beaches, and buying a jar of multi-coloured sand to bring home. It’s a very nice place, as I recall – not for nothing was it namechecked in the Beatles’ When I’m Sixty-Four as a place to rent a cottage in. The only other thing that puts the Isle of Wight on the map for me is that three-quarters of top 80s band Level 42 were from there. Whatever happened to them and their whacky slap-bassmeister Mark King? I caught up with them as part of researching this blog post. (Don’t worry, I didn’t.) The Isle of Wight is also famous of course for the festivals, which featured three of my favourite people, Jimi Hendrix, Bob Dylan and Leonard Cohen. The Isle of Wight seems to me a very “English” place. Its official tourist website describes it as “England in a nutshell”, the I Love Ryde website has a video of morris dancers, the island’s MP varies between Conservative and Liberal Democrat (i.e. no difference) and its main local newspaper is the Isle of Wight County Press, which Wikipedia tells us quaintly “costs 75p. It discusses local issues and is published each Friday, or the previous working day if the Friday is a public holiday.” The article compares the island in size to Rutland, which is not to be confused with Rutland Weekend Television. But back to Ryde. 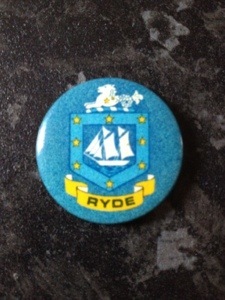 Again, why a badge just for Ryde? Do each of the island’s towns compete with each other? Are you only considered a proper visitor if you have the full collection of badges from all the other parts? Ryde is the island’s largest and most populous town, and I guess the ferry probably docked there, and not having a car we wouldn’t have strayed much further on our visit than the town of our arrival. The coat of arms is intriguing but I can’t seem to find much about it: this charming enthusiast’s site has a larger version (at the very bottom 0f the page) although labels it the “Medina coat of arms”, further Googling of which reveals completely different designs. I like the little sea monster at the top though, like a sort of horse mermaid; a merhorse, if you will. The yellow stars on the blue background also echo the European flag, and I like the idea that that might annoy some of the little-Englanders who run the place. UPDATE: My excellent friend and sauce expert Ali writes: “Also in Ryde there is a Donald McGill ‘saucy postcard’ museum, which is fantastic and well worth £3.50″. That site also has an absolutely charming and exquisitely-worded section about whether the museum is suitable for children (it is, of course, but given the sort of horrors that children are often exposed to these days it’s lovely of them to even think about putting that on).